Ever felt so busy putting out ‘fires’ in your classroom or dealing with challenging behaviour and classroom management issues that you felt a lack of personal connection with your students? On the flip side, have you ever felt such a strong connection with your class that you felt that you could challenge them to tackle the toughest learning obstacles without fear and anxiety? I have felt this way too! Right now I am somewhere between these two extremes. 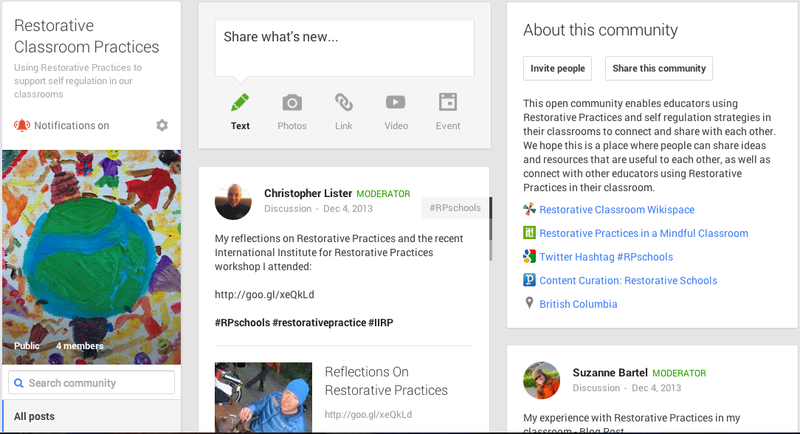 Restorative Practices has been both my nemesis and saviour along the way. One area of my own teaching practice that I have been focusing on this school year is building a stronger classroom community where students feel supported and support each other, where students can show vulnerability and feel safe to take risks, and where we are accountable for our actions and learn from our mistakes. I am a firm believer that the social and emotional needs of my learners need to be met first before any academic learning and growth can occur. That’s why I have been using the Restorative Practices framework in my classroom for over three years. Since 2010 I have been following the Restorative Practices framework with mixed success. Occasionally, I experience real and meaning classroom discussions, personal student growth, and culture change in my classroom, but more often than not, I have felt that my students just going through the motions. Before attending the recent International Institute of Restorative Practices workshop in Port Coquitlam my understanding of this framework had plateaued and it was evident I was struggling to see the same value I had seen earlier in my career. Halfway through the first day I suddenly realized what had been missing. Bruce Schenk, director of IIRP Canada, shared some images from a picture book titled, A Restorative Story: Mary Finds Some Money about a girl named Mary who stole some money from her next door neighbour, and it suddenly clicked. Not since the first year of implementation had I actually taken the time to properly introduce the design of Restorative Practices, or explained why this way of being was so important. As an intermediate teacher, I know that students learn a great deal from storytelling combined with visual cues. Soon after I returned from the conference I ordered a copy, and I am excited to share it with my students. I think it will help them to understand that building and rebuilding relationships is the essence of our community. The conference was also useful to refresh my understanding of two key concepts of restorative practices. The Compass of Shame, based on Dr. Donald Nathanson’s work, explains how people react to shame. Ever get the response, “It wasn’t me it was …” or the silent treatment from a student when you ask them what happened? That could be shame! I learned that shame is not good or bad it just is. We all experience shame to varying degree but it is how we deal with that is most important. Nathanson explains that people who experience shame show it in one or more of the following ways; attack self, withdraw, avoid, or attack others. Those who do not have opportunities to express shame in a safe and supportive environment may become disconnected from their community, whereas those who work within the Restorative Practices framework have a space to express their emotions and can lessen the intensity of them. The Social Discipline Window, the work of Australian criminologist John Braithwaite, refers to the way we work with people, or in my situation how to work with students, staff, and families. It works on the simple principle that people reacted better to leadership when leadership works ‘with’ people rather than does ‘to’ or ‘for’ them. When I work ‘with’ students, I involve them in the decision making process and hold them accountable for their actions. The environment is high in support and high in expectations. This relatively simple graphic, now embedded in my mind, serves as a gentle reminder of the educator and person I strive to be. Return to explicitly teaching the restorative framework using Mary’s Story as an example, and remind students that the classroom is a place for building and rebuilding relationships. Attempt, in a more formal manner, to directly link restorative practices to an increase in student engagement and achievement. Continue to use classroom circles to connect each morning, and start to implement more academic circles. To be more mindful of using restorative language in all aspects of my teaching, work, and life. 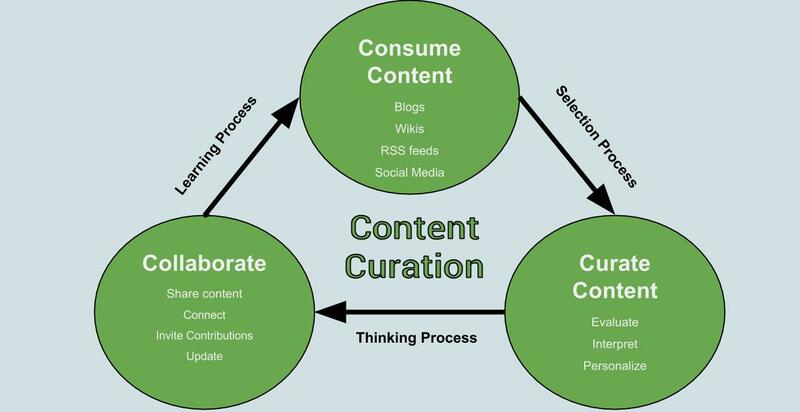 In my #TIEgrad class, I have been learning about the value of digital content curation. I used to think I had pretty strong curation skills because I used Diigo as a tool to collect and store important links. Fortunately, having had the opportunity to deepen my understanding of content curation I have found the quality of content I now collect and share has increased significantly. The process of curation is a noble one. Curating content on a particular subject also helps others find those needles in the haystack. Digital curation is the selection, preservation, maintenance, collection and archiving of digital assets. but that much information is now created every 2 days, and the pace is increasing. Online content can be viewed as a continuous stream of data cascading in front of our eyes like a powerful waterfall. It is endless flow of user-generated content (blogs, video channels, social media platforms) and publishing (newspapers, websites) and it is ever increasing. So how do we make sense of it? Historically, we used search engines like Google, Bing, and Yahoo, but even with advanced search algorithms developed by these companies results are at best ineffective. No algorithm can compete with the effectiveness of an individual who is knowledgeable in a particular content area, collecting relevant and meaning information on a specific topic, and sharing it with a like-minded audience. Consuming information, for the benefit of deepening ones understand of particular topic, is best served manually rather than using automated practices such as search engines. More than merely collecting content on a specific subject; to curate is to make sense of the information we consume online. Strong curation involves carefully selecting content and evaluating it for a specific purpose, topic, or subject. It also involves making decisions about what is and is not useful to deepening understanding of the subject. Content deemed useful can then be customized and personalized, by the curator, by adding ones professional experience to enhance it before sharing that curated content with one’s learning network. Curating is a higher-level thinking skill. In order to curate content that is useful for others the content needs to be synthesized, evaluated, and interpreted before being disseminated. Well curated topics and subjects help to inform and allow learning to happen at faster rates. Finding great content online is one thing, but being able to package it into a format that will help inform others is quite another. Best practices on how to share content involve inviting others to contribute, disseminating curated content on a regular basis, and making sure that the content you share has been evaluated and meets the needs of your target audience. Once they find a quality, curated collection, they’ll stay for related offerings. Bring Your Own Device (BYOD) agreements are being developed in many school districts across the province, and although they vary in content from district to district, there are many similarities. I am currently working on developing a draft BYOD agreement for my district and I wanted to take the time to share my learning. Agreements to support the use of student’s own devices in schools, to educate students and staff on the consenting use of devices, and explain the consequences of misuse of the networks which support the devices. There currently exists a wide range of different BYOD agreements; some brief and others extremely lengthy. It appears as though no one BYOD agreement is a best fit for all schools, so make decisions that best fit the unique needs of school or district. Why Do We Need BYOD? We are in a time when so much of the research, inquiry, and collaborative learning students complete in a day are enabled by the use of devices such as a smartphones, laptops, or tablets. Schools and school districts do not have large enough technology budgets to accommodate the seer volume of devices required, so a well thought out BOYD agreement would enable students to engage in 21st Century Learning, and at the same time alleviate some of the budgetary concerns facing many schools. In addition, it is important to acknowledge the efficiency benefits of BYOD agreements. Without BYOD, students may need to spend unnecessary time learning unfamiliar software programs pre-installed on school devices before they are able to complete the required learning task. In contrast, students who are permitted to bring their own devices to school are already familiar with them and can attend to the learning task right away. It is critically important to clearly communicate the rationale of BYOD with all partners in learning; students, teachers, parents, and guests. Including the BYOD in a general acceptable use policy (AUP) is one option, but a more targeted approach might be more successful. Listing the BYOD agreement on the school district website, emailing it out, or adding it to each students’ school registration process might be more beneficial. It is important to clearly communicate what type of devices are permitted under your BOYD agreement: smartphones, tablets, netbooks, and laptops, and what the minimum hardware/software requirements are needed to gain access to the network. No teacher wants to spend their morning trying to get an outdated netbook connected to the school wireless. In my school district when I, or when students in my class, have hardware/software issues we submit an IT helpdesk e-ticket, but what happens when the number of devices in my class increase with BYOD? Will the IT department be overwhelmed with additional requests? Will the IT department be expected to provide students with service level agreements? What will happen when student data is lost, and will more infrastructures be needed in school? I think students will need to charge their devices in the middle of the day, and schools/districts may need to consider charging stations at some point in the future. Network security is an important feature of BYOD. We asked ourselves questions such as, how will you manage the network with respect to restricting access to certain sites at certain times? Would we continue to use Ministry filters from PLNet, or would consider using our own internal knowledge to program our own filters? Another questions raised by middle/high teachers were related to bandwidth. In one particular school, the WiFi bandwidth was seriously impacted as soon as buses started to arrive at school. As a 1000+ students started to walk through the doors and their phones started to auto detected the network, the network slowed to a crawl. In our discussion we decide to limit the number of devices a student can use to connect to the network, block certain sites during recess and lunch, and have several different wireless networks in school to accommodate different users such as staff, students, and guests. We are currently looking into Bradford Networks to assist us with providing the software to manage our networks. They will be able to register IP address, track infractions, block access to network and sites, and manage security threats. Along the way to developing an agreement, we came across many questions we have yet to decide solutions for. For example, what happens if a device is lost or damaged on school grounds? Who covers the cost of fixing the problem or replacing the device? Schools simply cannot afford to replace the cost of damaged devices, so the sole responsibility needs to lie with students, but will this result in students, who have devices, deciding not to bring them to school in fear of damaging? Perhaps students will need to purchase a type of insurance to cover the costs of damaged devices in schools. What happens to students who misuse the networks they are accessing? Will sites be blocked during recess and lunch? If so which ones, and will this decision be made at the district or school level? Will a BYOD agreement mean unexpected and additional work by IT departments? What Does It Mean To Be An Open Educator? My understanding of Open Education is that it represents a mindset – a way of thinking of others instead of ourselves. Educators who engage in ‘open practices’ create a culture of sharing, collaboration, and cooperation. They work together toward a common goal. Each one offering a unique perspective, or enriching the process of collaboration with their past experiences and knowledge. It can start local with team teaching or grade group collaboration within a school, or it can extend beyond the boundaries of the school to the virtual world. Massive Open Online Courses (MOOC), for example, are readily available online, and cater to a variety of subjects areas and topics. These courses allow learners to connect via the web, share their knowledge, and better their understanding of the subject matter being discussed. There exists technologies, which allow educators to connect in more informal ways but many of them are hidden behind passwords and usernames. When we adopt a mindset of open practices, as educators, our practice can flourish and our students thrive. One of the most exciting aspects of open education, as it relates to my own practice, is the ability to participate in my own personalized professional development. I don’t always feel like I connect to the professional development opportunities that my school district hosts or those offered by my school, but I do get excited knowing that I can connect with other educators in subject areas of interest, and create, share, and adapt content, which I can then used to enhance the learning experience I have with my students. Open Education also has real and meaningful impact outside of my own classroom practice. It has huge implications from a social justice perspective. I spend a lot of time engaging my intermediate students in service-learning projects that help them to understand, and create awareness around, local and global issues. Our many discussions over the years always lead back to the root cause of many social justice issues, education. Institutional-based education is not readily available for many children around the world, particularly girls, so access to education via the Internet is critical to helping us solve this problem. Closed practice educators may be more concerned about claiming ownership of knowledge, protecting intellectual property, or simply feeling like they have nothing to offer others. I get it! It is not easy to be publicly visible about your practice because you open yourself up to the possibility of criticism and critiques. Fear can also limit open practices. Recently my school district adopted Sharepoint as tool to better connect students and teachers in the district. It is a step in the right direction but the tool is only really meaningful in the closed environment of our school district. It’s not possible to share documents, and create content with anyone outside of our group. Why? Perhaps schools feel anxious about privacy and the potential dangers of open practices, or maybe they feel the need to exercise control over knowledge and information. My students can definitely learn a great deal from the skilled students and staff in the district, but I am certain they can learn an awful lot from those outside of my district, as well. What Tools Do Open Educators Use? Educators who engage in open practices often need specific tools to help them connect with like-minded professionals. Some of these tools may be described as Open Educational Resources (OER’s). In order for an educational resource to be classified as open, it needs to meet four key criteria. OER’s need to be intentionally created for others to redistribute, reuse, revise, and remix. Creative Commons work meets many of these requirements. Unlike a research paper or a textbook, which is created once and is static, OER’s are dynamic. They are always a continuous work in progress; much like the educator I strive to be. What Do We Need In Order To Create Change In Education? I don’t claim to have any answers to the above question, but when Heidi (@h_james18) from my #tiegrad Master’s class asked this question on Twitter recently, my mind began to wander. When I’m wrapping my head around big picture ideas it sometimes helps to look at the situation from the opposing direction. With that in mind, I think I know what we don’t need. We don’t need sweeping changes laid forth by a panicked government trying to play catch-up, nor do we need top down directions from our school districts, and I’m pretty sure that throwing money into technology for technology’s sake isn’t the answer either. Maybe we need to start small… We can’t change the face of education tomorrow, next month, or even next year so let’s not panic! A little self-talk for myself there… We can, however, start to make small changes by connecting, and sharing ideas, with like-minded educators in our buildings, our school districts, and our learning networks. I think we need to become creative at finding the necessary time to connect. Time, built into our daily work schedule, where we can meet with colleagues and grade groupings to hash out best practices and create authentic learning opportunities for our students, outside of the four walls of our classrooms. In Will Richardson’s book, Why School, he talks about the importance of unlearning and relearning in our teaching practices. Unlearning and relearning doesn’t always happen in the confines of our four classroom walls, nor does educational change. Most importantly we need the confidence and the support to make changes in our own practice. Change not for sake of it, but change based on empirically sound research. We need to practice in ways that students learn best. Tom Schimmer, a BC educator and an expert on assessment, talks about the four stages of changes; new ideas start off being marginalized, then ridiculed, often criticised, before finally being accepted. It serves as a good reminder for me that we need support for educational change to take place. What are the impediments to educational change? I suppose this could be a standalone topic by itself… Sometimes I think students themselves may represent impediments to change. I wonder if they have the skills to fully embrace a model of personalized inquiry-driven learning? I know so many of the students I work with have become so ingrained with the stand and deliver model that there is sometimes confusion or anxiety toward a different approach. Could our school buildings be impediments to educational change? Sometimes, I wish I could knock down the classroom walls and join my kindergarten buddy class for the day. Would a major restructuring of the physical space in our schools send a clear message that we value multi-age working groups that are based on interest level over groupings based on age and associated grade level? Are our current data gathering and reporting methods impediments to change? When I am required to give my students a standardized math assessment at the beginning of the year that I know full well they are going to bomb, I question the validity of some of our methods of gathering data. When students are excited to receive their report card, not to celebrate the learning that has taken place or hear about areas of growth, but to count the number of A’s and B’s they received, which they can later transfer into cash from their parents, there is a clear problem. What are you thoughts on educational change and its forces of resistance?